Interested in learning how variable data messaging achieves better direct mail response rates & increases lifetime value? This eBook is designed for companies that do not want to compete on price but rather want to rely on their value proposition to demonstrate, and charge, for added value. The primary goal of the eBook is to help you find ways to save money by spending less with variable data printing. There is a lot that goes into this new philosophy of 1:1 marketing. A few years ago, personalization was considered to be accomplished when a customer’s name and address were ink-jetted into the address block, replacing the impersonal "Current Resident." 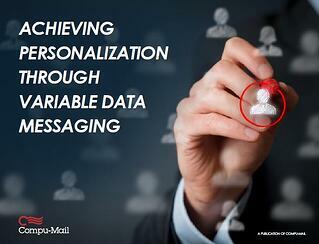 Today, personalization needs to go a lot further. If you are going to get a customer’s time and attention, they demand that the message is relevant and of interest. Relevance spans far beyond knowing someone’s name. To get a customer’s (or prospective customer’s) attention, you need to understand what they like, what they shop for, who they shop for, why they shop for items, when they shop, what motivates them, their personal interests, etc. Getting to know your customer at that level can feel like an overwhelming or daunting task, but is achievable when you have the right in-house expertise or the right strategic partner. Download this eBook to keep reading!